Whether natural or man-made, disasters will inevitably occur, which is why organizations must be constantly alert and ready to meet any such challenges head-on. Crisis Management: Concepts, Methodologies, Tools, and Applications explores the latest empirical research and best real-world practices for preventing, weathering, and recovering from disasters. 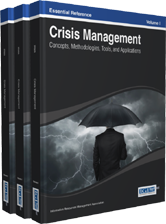 From earthquakes and tsunamis to nuclear disasters and cyber terrorism, this extensive multi-volume compilation describes crisis management techniques for a variety of critical scenarios, providing leaders, managers, analysts, and workers with invaluable knowledge on how to recover swiftly from any crisis event.